New York City native H. Max Rosenthal, 18, is a Senior at Léman Manhattan Preparatory School. Born and raised on the upper east side of Manhattan, Max has spent nearly all of his life enjoying a passion for the performing arts, and refining his considerable skills for a career on stage! An eighth-grade production of "Once on This Island", where Mr. Rosenthal performed as the character Papa Ge, is listed among his earliest credits. It was during this production that the accomplished young vocalist and writer discovered his new passion for the dramatic arts, and it has remained a vital and thriving part of his life ever since. In the following years, with his mentors and arts teachers instantly discovering his talents for vocal mimicry and dramatic performance, more and more stage opportunities presented themselves. A high-school production of "Little Shop of Horrors" actually featured Max in multiple supporting roles, demonstrating his impressive acting and singing talents to a captive audience. Soon after, he expertly performed as Marius in a high-school staged concert of "Les Misérables", once again revealing himself as a natural actor/ singer! Mr. Rosenthal takes great pleasure in the artistic process of drama, finding tremendous cathartic value in the act of casting away one's inner and outer self, while temporarily stepping into the shoes of another individual so as to speak with their voice and see the world through their eyes. He considers the ability to entertain people with his talents to be a vital gift, and one that he feels honored and privileged to possess. 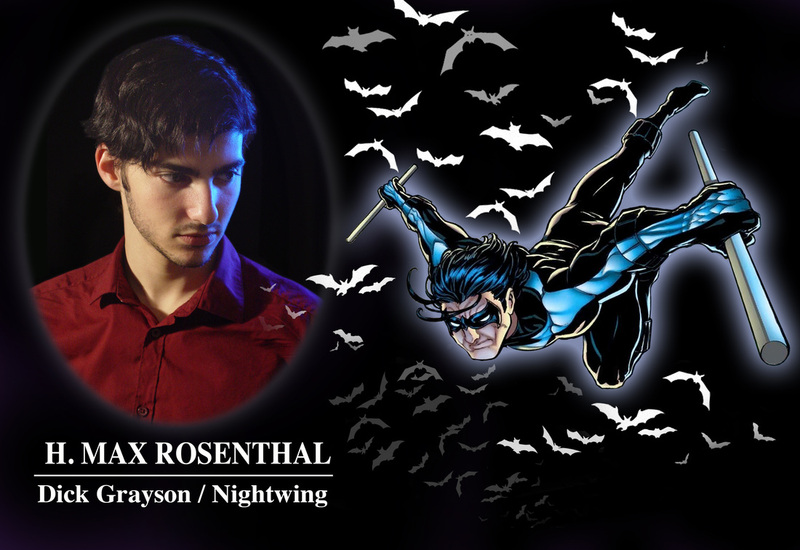 And now, Mr. H Max Rosenthal has enthusiastically joined the cast of “FATHERS OF THE DARK KNIGHT” as the classic comic book hero NIGHTWING! He is extremely excited to be a part of such this ambitious production.